energetically delivered, the songs of Coastwest Unrest defy genre but ring familiar. 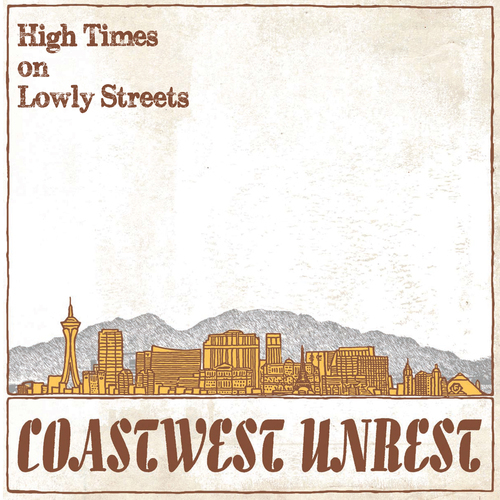 Their third album, High Times On Lowly Streets, weaves more than a dash of classical string elements into what could be roughly described as a folk/Americana/pop-rock sound. They’re difficult to classify, simply put. place as background texture and climbs to the role of primary instrument, influenced by highland fiddle as much as chamber music. The opener “Remembrance of Things Past” begins with a screeching ascent before bursting onto an upbeat rocker, while in “Empty Handed Painter,” the interplay of the violin and cello between verses feels tragic. After a few mid-tempo tunes with gorgeous strings, however, the novelty wears off some, although nothing in the vivid lyrics can be faulted. “Still Frightened” is where the band really puts on a show. Lead singer Nick Dickie’s gravelly baritone continues to remind of Eels’ Mark Everett, and overtop the chaotic swirls of an electric guitar, a distorted cello, and a whirlwind violin, he creates a fresh punk aesthetic. Classical music is lovely, but it’s been done before. High Times On Lowly Streets doesn’t quite settle that new frontier, but it at least plants the roots.